Janna Pelle, a young advertising grad from the University of Florida in Gainesville, builds her portfolio by helping promote a musician she knows very well – herself. Why? When a first-time professional steps into the competitive world of advertising, marketing and communications, she must stand out. Doing so sometimes requires some shamelessness. “I had a band in college,” Janna beings. “We were called Janna Pelle and the Half-Steps. We performed covers and originals around campus and venues around the city, we were the house band of the University of Florida family events, and we performed at all of the parents’ weekends. “My band – who were also my best friends in college – and I had just finished an album. As I was graduating, I knew I wouldn’t be in Gainesville anymore, but I did not know yet that I was coming to New York City to do music. Shameless Self-Promotion was the first album I had made without the band, and I started working on it knowing that I was going to be on my own soon. My drummer was going to law school, my bass player was going to be a teacher for Teach for America, and my guitarist would become an Apple Techie. I then listen to tracks on this album like “Machine” and “Accessory,” and feel excited about Janna’s music. As I research her discography and find her 2014 release, The Show Must Go On, I learn that she courageously shares with listeners the tough experience of her father, who battled cancer. When I sat down with Janna to talk to her about her upcoming album Key Change, I discovered a lover of music history seeking to include a niche audience, in addition to her target listeners – conservatory students. Janna has come to the right blogger. I feel delighted to welcome her as my feature interview subject for November on Music Historian. Prior to starting Janna Pelle and the Half-Steps at UF, Janna’s musical journey started at the tender age of 6, when she enrolled in piano lessons with a teacher, Rachel Currea. “My parents enrolled me in piano lessons when I was 6. I was enrolled because I have hyperextension of the inter-phalangeal ligaments. My parents did not know how that would affect me later in life, so they wanted me to exercise my hands. Janna did become musical, and eventually enrolled in a piano magnet high school, where she performed in state-wide classical recital programs. Throughout Janna’s high school education, Rachel acted as her trainer. When the young pianists had to decide on what to major in, Janna decided to continue with music without focusing on it as a degree. Hebrew music also slips its way into Janna’s repertoire. I wondered whether she liked Klezmer music – music I happened to play with a college ensemble at Syracuse University – and she claims her chord changes resemble that sound, but the instrumentation is very different. Listeners will not hear a wailing C-tuned clarinet in Janna’s music. However, the chord changes she talks about resonated a little with me, especially in her song, “Machine.” Further, she quotes a measure of a popular animated cartoon series television show from the 80’s. Can you guess what it is? Visit her website, www.jannapelle.com, listen to “Machine” and let me know in the comments section. “You hear the expression ‘trophy wife,’ but you can definitely have a ‘trophy husband,’ or even a ‘trophy relationship.’ You can carry around any kind or relationship as an accessory really. While materialism seems to largely lingering in the background of Janna’s lyrics, the artist does not consider herself a highly materialistic person at all. She defines herself as a sentimental person. Her 2014 EP, The Show Must Go On – a dedication to her father, Tony Pelle, demonstrates this more intimate and emotional side. Janna felt a need to write songs when her father was diagnosed with MDS, a type of cancer which is also known as “pre-Leukemia.” According to Janna, it goes without saying that songwriting served as a form of therapy for her. However, she felt humbled and happy to learn that it helped her family and listeners battling the same sickness. “My aunt would tell me, ‘Every morning when I wake up, I listen to “Kick It In,” and look at the slide show you made about my brother [Janna’s father]. That’s how I start my morning.” That was what she did until the day he died. She always used that as therapy. The MDS Newsletter featured Janna in one of their issues and distributed information about The Show Must Go On to all of their patients and support groups. People also started donating money to the album, which Janna in return gives to MDS research. “That is good business right there. People showed and demonstrated how your product helped them,” I remarked. “I think I would like to go into Non-Profits. Honestly. I will never feel as fulfilled as when I did knowing that I was helping people get through a seriously tough time,” she replied. It was certainly one of the most memorable shows I have seen on the Lower East Side. The amount of additional talent involved reminded me that there is room for everybody in music. While she might be promoting herself, Janna, like Alyson Greenfield, understands that artists live in a community where they have opportunities to support each other. I’m never one to directly ask a reader to listen to an artist’s music, but if you want to try and recognize the theme song of a popular animated cartoon series from the 80’s quoted in “Machine” of a listen to it here. If you can recognize the theme song, please write it in the comments below. Thank you! “Comrade” by Sylvana Joyce + The Moment, a track from their 2012 debut, For You, greets listeners with a Doina, the freestyle violin playing found in Klezmer music. Further, in the song, the Habanera rhythm – and yes, I do mean the one from the song that made Georges Bizet’s Opera Carmen an internationally recognized hit – will tempt a listeners’ curiosity. Let the track play further, and you will be led to a driving gypsy-like folk dance. I started listening to Sylvana’s music after I saw her and her violinist, Sean Cunningham open for Todd Carter’s performance at the Cutting Room back in June. I covered her performance and we communicated back and forth. I mentioned how moved I was by her story of how the Romanian folklorist musician, George Sbarcea, was her grandfather. I then invited her to read some of my father’s story. We learned that both of our parents had nearly identical stories about how they left Romania during one of the worst eras of communism in Eastern Europe. Naturally, I wanted to learn more about her background. More importantly, I was interested specifically in how she would describe her style of music, which she titled Gypsy Rock. “It’s an interesting question. Gypsies around the world get a terrible rap. In fact, there are still rumors in the states that all Romanians are gypsies,” explained Sylvana. She says, “Being a gypsy is an idea. It’s the idea that your home is not a place, it’s a feeling, and it’s a relationship you have with a person or an ether. I feel because our style is so diverse, we are a nomadic tribe wandering the world of genre. We fall in love with everything we come across, and we make it ours. I believe Gypsy Rock reflects the sentiment of wandering and finding our own version of an eclectic assortment of genres. Like many, I readily observe how music can connect the artist with the public. What interest me the most is finding an artist who can describe the experience through his or her own point of view. I welcome Sylvana Joyce to do just that right here on Music Historian. My talk with Sylvana about her music started in a model apartment within the Stuyvesant Town/ Cooper Village complex somewhere between Alphabet City and FDR Drive. 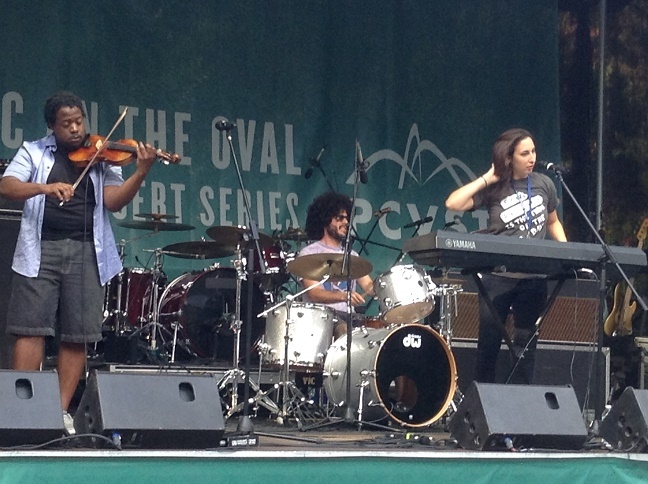 Following Sylvana Joyce + The Movement’s hour-long set at the Oval, we were escorted to the apartment complex. When Sylvana, her guest, per diem bassist in The Moment, and I arrived at the apartment, we all had a look around the place and commented on the excellent space. Sylvana and I then headed to the small kitchen for a beer and then proceeded to the dining room table a few feet away to conduct our interview. Sylvana, the singer, songwriter and pianist claims that she grew up in New York City, where she has gotten to know some of her band members from playing in a conservatory setting with them as a child. As a city-native, the bold and energetic artist reminds me how New York can be a tough scene for musicians. Although community-based places are sometimes overlooked by new music enthusiasts, these spaces enable the performer and audience members to have a better listening experience. For the musician, the sound system and the listening experience beats that of a brownstone pub. In addition, the listener can enjoy a pleasant, spacious spot on a clean lawn, sitting on a blanket with friends and breathe in an open space while experiencing the music. Aside from discovering their love for giving community-based concerts, Sylvana Joyce + The Moment quickly learned that industry players have an interest in their music. In just six months of the band’s inception, Sylvana Joyce + The Moment were winning international competitions, and even gained a week long coverage from MTV about the band, which included a new recording of their single, “The Break.” The music video can be viewed here. The group’s single, “The Break,” which has received the most attention successfully straddles the musical world of the 2 to 3-minute rock song, and the complex Eastern European-fused cabaret music. I then had two questions for Sylvana: What did she enjoy so much about Romanian folk music? Are the subjects within her songs inspired by real-life, fantasy, or the escaping into fantasy as a way to deal with real life? 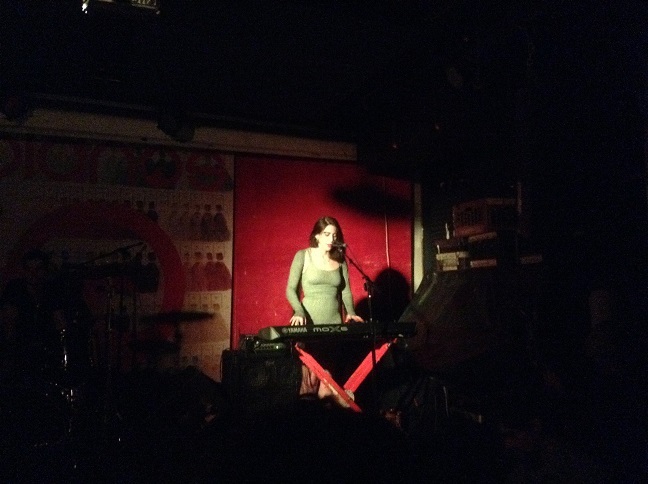 She continues, “Something that is really interesting… a lot of Eastern European folk music is minor. Romanian music is upbeat and major. It [might include] a few interesting minor melodies, but it has a very major and happy-sounding basis. “We are almost putting a certain genre of music… rock ‘n’ roll on a pedestal. I want the next generation of musicians to start thinking outside the box a little bit. I may be involved in projects that put together rock bands of completely crazy assortments of instruments. I want anyone who plays any instrument to feel like they can be in a rock band because it’s true! In addition to serving as a tool that can help artists reciprocate to the communities that fostered the musical development all each band member; songwriting has also become a form of therapy for Sylvana. “I kind of had a tough childhood. My father left when I was young, and my mom struggled to make ends meet. It [songwriting] was a way of expressing all of those difficult, sometimes ineffable situations. What I couldn’t put into words, the music would take over. “I’ve actually been writing music since I was a little kid… around the age of 4 or 5, just as silly and imaginative play. I just got very interested in the fact that musicians would put thought into what words went well with the music. I thought the marriage of the two was very interesting. As Sylvana helped me recall the Shakespearian story which I read many years ago, I was then reminded of the character Morgan from a recent flop-of-a-series about King Arthur produced by Starz called Camelot. I explained to Sylvana that like MacBeth, Morgan – who is Arthur’s half-sister – is so hungry for the throne, she depends on black magic to help her devise a plan that will kill her half-brother. The anti-heroine though has difficulty controlling her powers and depends on the help of her mentor, a nun who has been banished from her own convent. The nun reminds her that the best way to gain power is through earning the trust of her people, the commoners. Adding an adjacent story seemed to interest Sylvana. She then went on to apply another recent (non-fictional) story to the song “Comrade.” This story is about a malicious historical figure many Romanians know too well, Romania’s last communist dictator, Nicolai Ceausescu. “You know,” Sylvana begins, “Comrade” also reminds me of the stories my mom told me about Ceausescu. Ceausescu’s right hand, his entourage, would try to shield him from the truth of what his regime really created in the country. When he would visit the places of peasant’s, his entourage would arrive early and put nice things in people’s homes to make it seem like they were not living in squalor. The lyrics within the chorus of “Comrade” are – Could it be/ that you’ve been made a fool/ by you, yourself?/Turn back now/ it’s better for your pride/ to bruise than lose your soul. This is followed by the second verse, Memories, of all the people who made fun of you/ would creep into your consciousness/ and keep you up at night/ now they have become/ the people who will work for you/ they are on their knees smiling/ and reciting popular poetry/ through their teeth. Aside from “The Break,” most of Sylvana Joyce + The Moment’s songs are not the 2 to 3-minute tracks that many artists try to reproduce in the rock genre. While some bands have written great songs within this play-length, I have read comments from a handful of listeners who stream this type of rock music for free on Youtube, who often say, they want the songs to be longer. Sylvana’s music helps fulfill that wish with her 6 to 8-minute tracks, and “Comrade” serves as an example. Further, this length allows for so many different compositional movements, that it almost seems to be an eclectic circus of styles and genres facilitated by a classical music backdrop. I wondered whether Sylvana finds herself traveling throughout different genres in one song. “I grew up listening to classical music, not rock music. That came later in life, and also through the band introducing me. I think that classical influence, especially with Sean and I having played chamber music as kids, comes into play as we are creating the music together,” explains Sylvana. “It is that way for many songs,” she begins. “Sometimes, I have specific parts that I write for players, but [really] many influences come together to create something really special. She then adds, “I think something special about the group, is that I found musicians who I trust creatively.” This sense of security is critical to all musicians, and any ensemble working creatively together. Further, one must have trust especially if they want to be successful in their future endeavors. 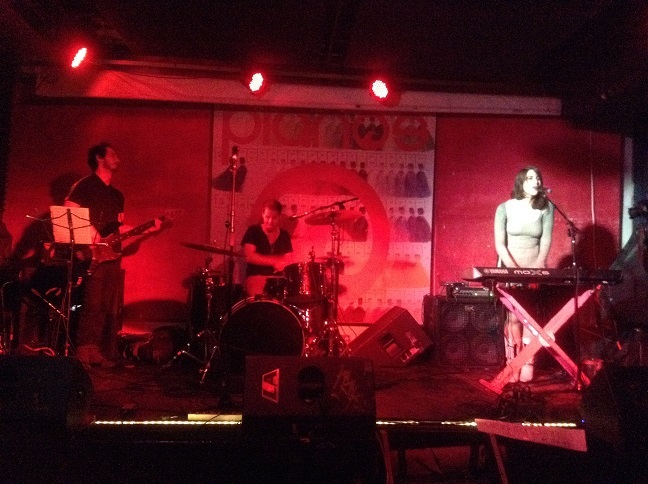 Sylvana Joyce + The Moment currently have a few immediate projects. One includes a new record, which does not yet have a title. “I think us as a recording band, and live artists are two different experiences. I’m trying to converge that into one cohesive sound in this upcoming record,” claims Sylvana. An additional creative endeavor that will serve more as a Public Relations tool is Sylvana Joyce + The Moment’s appearance in a South Korean indie film, produced by an independent agency TreeFilms. Sylvana talks more about how the film and how the band became involved. “The violinist of the band, Sean, performs in train stations every other day. A filmmaker visiting from South Korea one day noticed him, and Sean invited him to come see our set at the Brooklyn Bowl later that night. [This happened a few months ago]. He [the filmmaker] was so taken by our theatrics and music that he wanted to make a movie about us. “I feel that music is one of the most powerful antidotes to fear. It reminds us that we cannot always worry about [fear]. I also feel like success for me will come when I have given everything I can do creatively.” In my view, I believe Sylvana will feel successful when she knows her music will impact somebody positively. Based on what I see from this artist, the wider the performance space, the better. Sylvana can make her theatrics, dramatic character and boldness visible to all, which is why this band works well in a community-based space. In addition, the absence of walls makes it easy for that sound to travel and bring in passing audience members at their own volition. On the subject of performances, the band will have a concert, celebrating the release of their new single, “Rosie.” The show will be on August 24th at Rockwood Music Hall at 8pm. In addition to unrestricted physical space for her shows, as a songwriter, Sylvana exercises little control over others, yet enough control of herself. She embraces freedom enough to welcome to new ideas and accept other players’ roles within her music. For the community of classical, Eastern European, traditional Romanian and Gypsy music lovers, and fans of eclecticism; Sylvana Joyce + The Moment is a force to be reckoned with. John Elliott’s songs appeared on the television shows “Grey’s Anatomy” and “One-Tree Hill.” He even co-wrote a song within one episode of “Californication.” Yet, for most of his career, John remained an independent artist. Since high school, during his first attempt to write music on a blank tape from 1993, John knew he wanted to pursue music as a career. So far, he has entirely self-produced all his records, including his latest Good Goodbyes – the first record on which he played every instrument, and the one that perhaps presented the most challenges. Now, as he continues the journey he started long ago, John Elliott reflects on the radical experience of relying solely on himself to bring his music to fruition. It is my pleasure to welcome John as the featured artist for the month of March on Music Historian’s Hear, Let’s Listen. In the title track of his record, which is composed in a major key, John sings the following lyric, “I can’t let a good thing go even when it starts to bleed,” followed by, “Even when I know it’s dying and it’s time to set if free/ I’m afraid I won’t be treasured/the way she treasures me.” John wrote this song in 10 minutes one morning, without even writing the lyrics down. As a critic, I find it comforting when the title track of the artist’s album is born with little effort and yet holds so much meaning that analyzing the lyrics might take 10 days. “Generally, it’s doesn’t go well if I start by trying to write something with a message. That’s tricky. It’s better if the story, images, or lines are strung together by emotional truth of some sort. If you get that right, a message “might” emerge. The best writing is a little mysterious, but somehow makes perfect sense to your soul. You have to get your head out of the way and let your heart hear it,” explains John. Like most artists who perfect their craft (and the art of letting a song take its form without exercising too much control is one of the ways to be perfect), John has written, and rewritten a myriad of songs that did not make his latest record. By the time a song does make it on his album, he has “obsessed over every line” both lyrical and musical. Listeners, of course, are another important part to any musical experience, and John’s music is no exception. “Every listener brings his or her own unique perspective to the experience, and might hear something radically different than what you intended,” adds the artist. In the case of Good Goodbyes, I couldn’t help but feel that John really went out on a limb and made himself very vulnerable, especially since he was the sole creative and functional driver of this record. On his past albums, John included a number of different players in the process. He claims the making of his latest record “happened during a very solo time in my life and as the process of creating it continued, I realized it was important to me that I remained true to that. Good Goodbyes also taught John how much he relies on other people for approval about his music. Although he enjoyed the experience of producing and only answering to himself, he still needed a second set of ears. After putting the record through seven revisions, John invited mastering engineer JJ Golden to help frame the final product. Watching John during one of his live shows on his nation-wide tour back in November, I listened to and watched an artist whose music brought a character out of him, one who believes in himself so much and manages to attract an audience that believes in his sound and performance. I walked in to Cantina Royal, a restaurant in Williamsburg just in the nick of time to see John Elliott. Secured with a Brooklyn Lager, I traveled down a red-light lit hallway to a performance space behind a gritty grey door. In this performance space, there was no stage but a clear floor. There was plenty of room for audiences to take seats in rows of mobile chairs and mini tables. 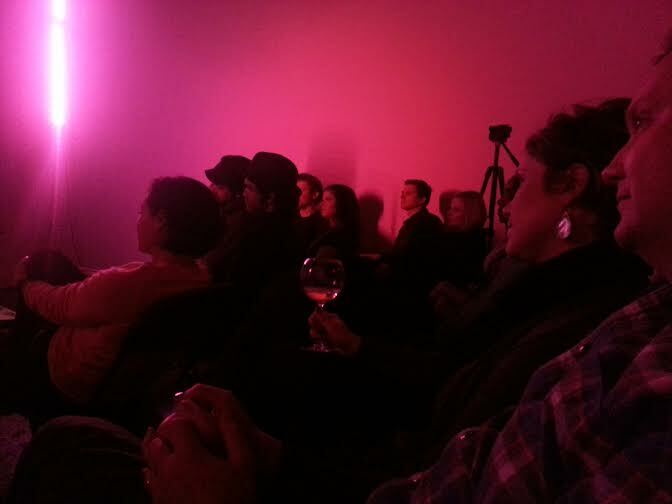 Pink and blue lights covered the space designated for acts. In the far left corner of the room, I noticed the uncanny detail of a rope that extended from the high ceiling and coiled out on the floor. Most chairs were filled, and the only available seat was at a table occupied by a couple. As I sat down and prepped myself for a night of intense observation and musical analysis, I occasionally peeked at the flirtatious exchanges between the man and the woman next to me. Underneath the table, the guy caressed his girlfriend’s bare knee as she sketched a picture on some scrap paper. Both shared a package of very low caloric snack of seaweed sheets. Perhaps they decided this food paired well with beer? I was not sure whether this combination was romantic or strange. Returning to John’s performance set, I knew I was in for a performance I would never forget. And I was right. During his song “Monogamous,” which is primarily built on ambiance created by electrical and synthesized instruments playing held out notes, there is a long period in which John does not sing. On the record, the artist can get away with this, in a performance it is a different story. 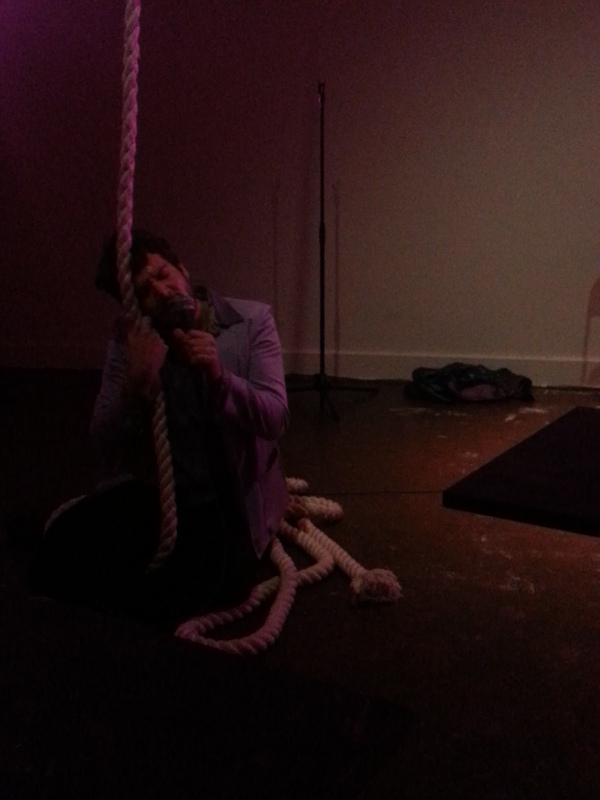 John knew he had to fill up that silence with something, so he started to swing on a rope in the far left corner of the room; a move several audience members found amusing. For his next song “Yin and Yang Collector,” John had a costume change. He dressed as a king, one that somebody might find in a frat house in New Orleans as opposed to one in a dramatic film about Henry VIII. 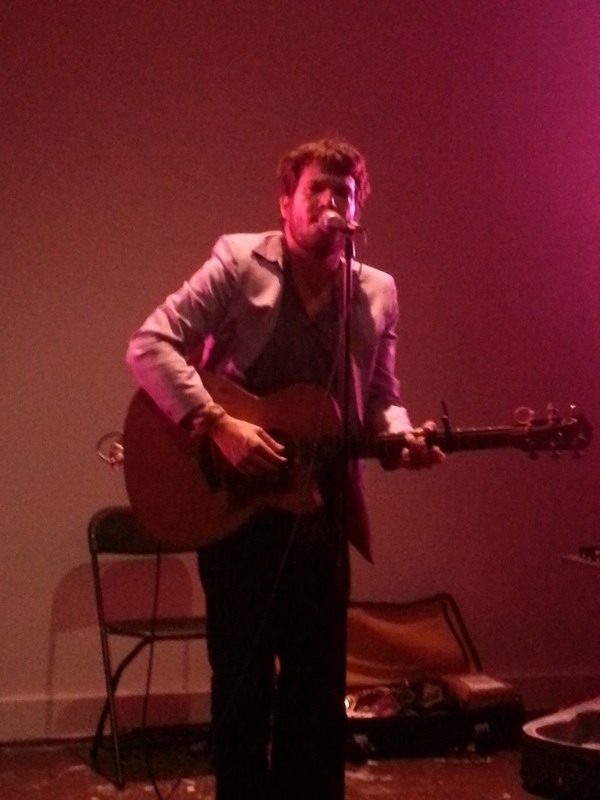 During this song, he picked up his guitar and started playing like a true singer songwriter. But, I soon learned the surprises were not yet over. John did not finish “Yin and Yang Collector.” Instead, he looped into another song, a cover of “Somewhere Over the Rainbow,” then transitioned back to “Yin and Yang Collector.” An artist successfully and easily accomplishes this only when the tonic of another song is the dominant or the predominant of the song they initially sing. This makes for easy modulation, and often, one will not find artists doing this during a performance but rather in their private time practicing. As I looked back to the couple, I noticed the woman started sketching a new picture, one of a masked face that imitated the appearance of John’s costume. It made sense then and there that something about John’s performance successfully captivated the imagination of one and perhaps multiple members in the public. When I asked John what audience members said about his music during his tour, he remarked that most of what he heard has been “positive!” That or complete silence,” he adds. “A few people said it’s their new favorite. One person told me how much they liked this album more than the last. John recalls a few moments from his tour in which listeners did not enjoy his set. 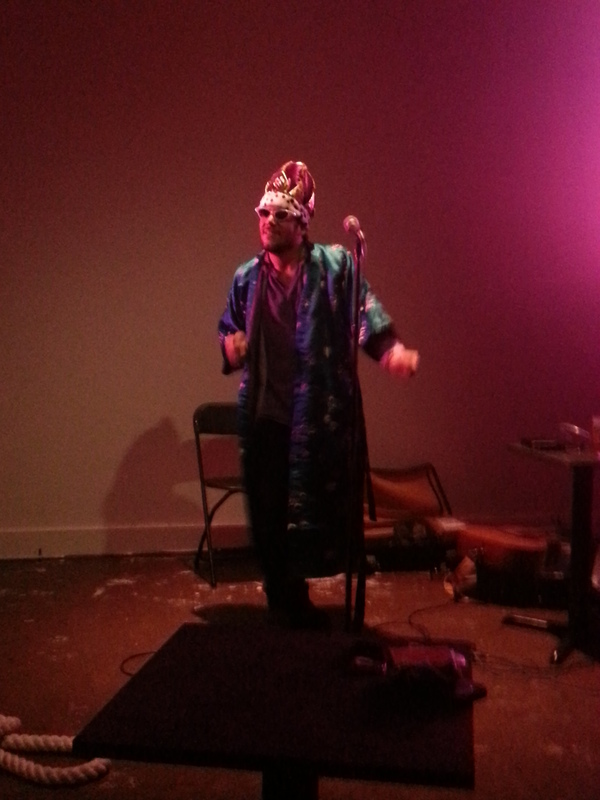 During his show at Cantina, he humorously told the audience about the reception of one of his songs. Currently, John is in between touring for Good Goodbyes. His agent is currently booking shows in the Midwest for 2014. In the meantime, he tackles the toughest component of any business plan, the marketing of his product. John’s story of making and promoting Good Goodbyes is honest. It reminds listeners that like heroes in our favorite novels and films; if a musician does not go through any struggle, whether it is letting go of an old relationship, a bad habit or faulty belief, or a challenge of understanding business or making music, there is no reason for that listener to care about the artist. As for John’s music on Good Goodbyes, which is now available on iTunes, his website http://thehereafterishere.com/recordings, on Spotify, and, of course, at his live shows, the album will draw listeners into his world of expression, one that reaches the soul on an esoteric yet comforting level. Perhaps it is no surprise why his songs appeared in the hit television shows among audiences that fall within the 25 – 40 year age range. John presents us with something worth listening to, but we have to get out head out of the way and let our hearts hear it first. Celebrate Eclectic Music at Rockwood with Syzygy, Danielle Eva Schwob & More! The Fall of 2013 is transforming into a busy season for music in New York City. Indie lovers and musicians alike can expect a trend of eclectic musical performances; bands from across several genres playing in one set under one roof. This Sunday, September 29th, the Musical Variety Show presented by the musical collective Syzygy will kick-off this Fall’s indie music season at Rockwood Music Hall. 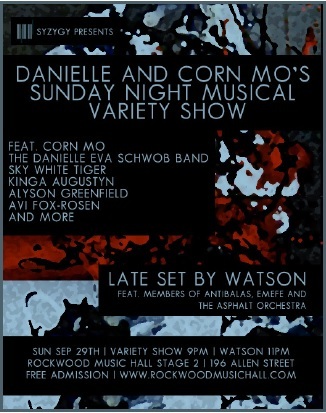 Entitled ‘Danielle and Corn Mo’s Sunday Musical Night Variety Show,’ the event will feature performances by its two hosts and guest artists like Sky White Tiger, Kinga Augustyn, Avi Fox Rosen, Alyson Greenfield, and more. Watson, which features members Antibalas, EMEFE and The Asphalt Orchestra, will conclude the night with a late set. Corn Mo, who is currently a part of .357 LOVER and a former member of the Polyphonic Spree has become known as a “regular fixture in New York’s indie rock and experimental scene.” He has an unmatched knack for story-telling and performing, and has toured with acts such as They Might Be Giants, Wheatus and Ben Folds. The London-born cross-genre musician, Danielle Eva Schwob – whose “hard edged pop songs (NY Times)” fuse glittering synthesizers and electric guitars with honest lyrics – is best described as a catchy avant-garde pop/rock performer. Both musicians will host the show, and Ms. Schwob will appear with her band and Corn Mo will perform solo. Sky White Tiger’s front man and multi-instrumentalist, Louis Schwadron; classical virtuoso and stunning vocalist, Kinga Augustyn; Sardonic indie songwriter Avi Fox-Rosen; and the sonic-wizard, singer and multi-instrumentalist, Alyson Greenfield will all perform. The night will wind down with a late set by downtown improvisers Watson, an all-star group of musicians hailing from Afrobeat stalwarts EMEFE and Antibalas, and the radical five-piece street band The Asphalt Orchestra. Danielle and Corn Mo’s Sunday Musical Night Variety Show marks the second installment of SYZYGY’s acclaimed series, the first of which took place at Le Poisson Rouge and welcomed Sxip Shirey, Todd Reynolds, ETHEL, Danielle Schwob and Bridget Kibbey. The show will take place at Rockwood Music Hall, Stage 2 and will start at 9:00pm. Admission is FREE, and everyone over the age of 21 is welcome. Rockwood Music Hall is located at 196 Allen Street. The closest subway is the downtown F train which stops on 2nd Avenue and East Houston Street. The most successful bands establish a memorable sound, the one that encourages listeners to return to performances and purchase the group’s music. In the process, artists might find that the music they create does not fit a label. Jeff Kerestes, a professional bassist of the Brooklyn-based band Apollo Run, briefly explains this experience. In Music Historian’s full-length band interview for May, Jeff talks about how Apollo Run’s “Here Be Dragons” exploration started; where the course has taken them; the possible conclusions of their journey; and what awaits the band in the near future. It is my pleasure to welcome Jeff to Hear; Don’t Listen. One night in 2007, the Arizona-native with a jazz degree from Arizona State University, was celebrating his one year anniversary of living in New York City. Through the husband of a friend, Jeff learned of a band that was looking for a bass player – John McGrew and the Sit Backs. Jeff joined this group in December of that year. Here, he met singer John McGrew and drummer Graham Fisk. “John and Graham hit it off right away,” recalls Jeff. 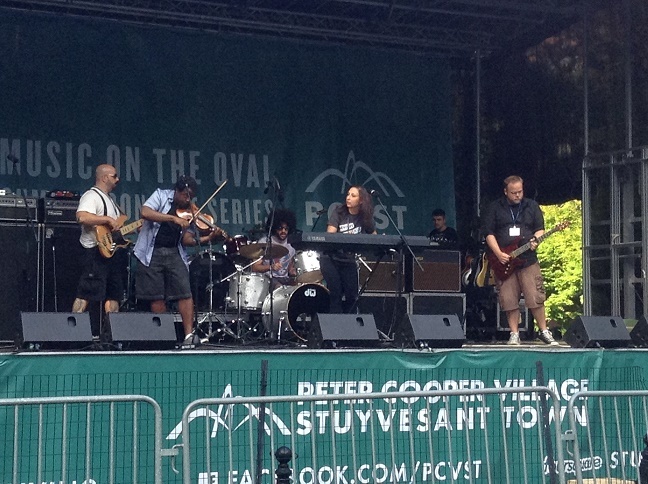 “The band also had another bass player, a guitarist and keyboard player. “In this group, all the songs were fully-written by John and the members of the band would play these songs and perform under the moniker John McGrew and the Sit Backs. At that time, John was working a day job just to pay the band. In New York, there is almost nobody that will play another person’s song for free. “Eventually though, paying the band became expensive, and John decided to leave his day job and do music full-time. Since John McGrew and the Sit Backs was the best experience I had at the time, I decided to stay, and so did Graham. At this point, it was 2009, and John, Jeff and Graham decided they wanted to bring a new approach to music making – one in which all three members could use their ability and talent to the fullest and tie it together into a series of songs. “One of the most exciting parts about Apollo Run is that we all write, and we will bring different ideas to each other. “For example, John and Graham were both in a Cappella groups in their college years. Sometimes, John will have a great a Cappella line, and we’ll develop a song from there or, he will come to us with a song that is almost finished, and we’ll complete it together. Jeff enumerates on this example through a few stories about some of the songs on “Here Be Dragons” vol. III. “One of the songs on our last record, “Sirens,” we wrote while we were on tour. I was playing chords on a ukulele during the car ride. In this time, we created the hooks of the song. Then, when we halted for rest stops, we would refine the lyrics and the vocal lines. Prior to recording any of the “Here Be Dragons” records, the band applied the same intuitive effort behind finding the band’s new name. Listeners will have a difficult time putting Apollo Run’s music neatly in a category. One might feel that the opening piano melodies to “Autumn Song” that paid homage to art songs from the Romantic period; or that the doo-wop-feel of “That’s How it Felt” belongs more to pop; or that the “Devil in Disguise” makes a slight nod to the swing-jazz genre. The eclectic sounds of each “Here Be Dragons” album might also make listeners wonder what made the band chose the name Apollo Run. For this simple reason: it felt right. According to Jeff, all the members liked the mythology behind the Greco-Roman God Apollo, who ruled music, poetry, and light. In addition, John who is also an astronomy enthusiast repeated the phrase “Apollo Run” to himself several times. The more he heard it, the more confident and comfortable he felt with the name. “You never know where your inspiration is going to come from; it can be from literature to what’s going on politically. A couple of our songs are inspired the book series The Game of Thrones. Sometimes John will come to us and say, “I wrote a new song, it is inspired by The Game of Thrones,” says Jeff jokingly. Then, some of the inspirations for Apollo Run’s songs come simply from gazing up at a clear night sky. “Our song “Stars” is basically John’s take on what he hears from looking at the stars. As they twinkle back and forth, John hears they are singing “oh-way-oh,”” explains Jeff. Apollo Run plays on romantic imagery while celebrating the union of many musical ideas. In addition, fans’ responses to the band’s music have been supportive and unusually phenomenal. The End: A Theatrical Reception? During the summers, John, who has a background in musical theater, works at a drama camp in Oakland, Maine called Acting Manitou. Every year, John helps students put on a play. According to Jeff, “the kids really liked Apollo Run’s music” and they wanted to make a play using the band’s songs. “Last year, the kids asked whether they could put on a play using Apollo Run’s music, and they did,” enumerates Jeff. “Graham and I went to perform the music for the production. The result was amazing. If the “Here Be Dragons” saga does not end with a big bang, then fans can look forward to a fourth album in the near future. Jeff says the band is in the process of creating a new record that will focus on this idea: now that the territory has been explored, it is no longer uncharted. “We are currently in the writing stage,” he explains. “The songs are very exciting right now. In the meantime, the band continues to receive a positive reception from fans all over the country. Jeff recalls Apollo Run’s first national tour from November, which was to promote their third volume and first full-length album “Here Be Dragons” vol. III, as a career milestone for the group. “That was pretty big for us,” enumerates Jeff. “We started on the west coast in San Francisco, then drove all over the country for a month. We traveled to my hometown in Arizona, then to San Diego, and several other places before concluding the tour in Maine. “Our fans traveled great distances to come see us perform, and it was rewarding to see them enjoy our music. Apollo Run reminds listeners that while establishing a solid sound is a necessary component for a successful band, creating music is not about fitting neatly into a category. Reflecting on my interview with Jeff, I realize that a band’s potential relies on their ability to explore new musical territory despite the uncertainties or possible dangers. Apollo Run’s exploration helped them arrive to the destination they sought – a definition of their sound. In addition, their expedition contributed greatly to their artistic development. The result is the complete “Here Be Dragons” trilogy. On the hot and muggy Thursday, June 21st, I traveled to Williamsburg to visit the Cyn Lounge. Here, Avi Wisnia was hosting his annual BBQ Block Party. Although the heat persisted as 8:00pm rolled around and I was sweating through my work clothes, I was happy catch up with Avi to hear some of the bands in his line-up. One band I particularly enjoyed was 3dCosby. The songs by this band that caught my attention included “Paint by Numbers” and the humorously-titled track, “Star F*cker.” Both songs are featured on their latest record, Satan’s Secret. All of 3dCosby’s tracks combine funk and jazz. Occasionally, they will add a special musical technique called polyphony – the playing of four different voices or melodies produced by the guitar, keyboard and bass all at the same moment. During their performance, the front man of 3dCosby, Daniel Harris, invited audience members to dance to some of the instrumental pieces. The audience, me included, responded positively, and moved to the rhythms of their songs inside the small cemented outdoor space of the Cyn Lounge. 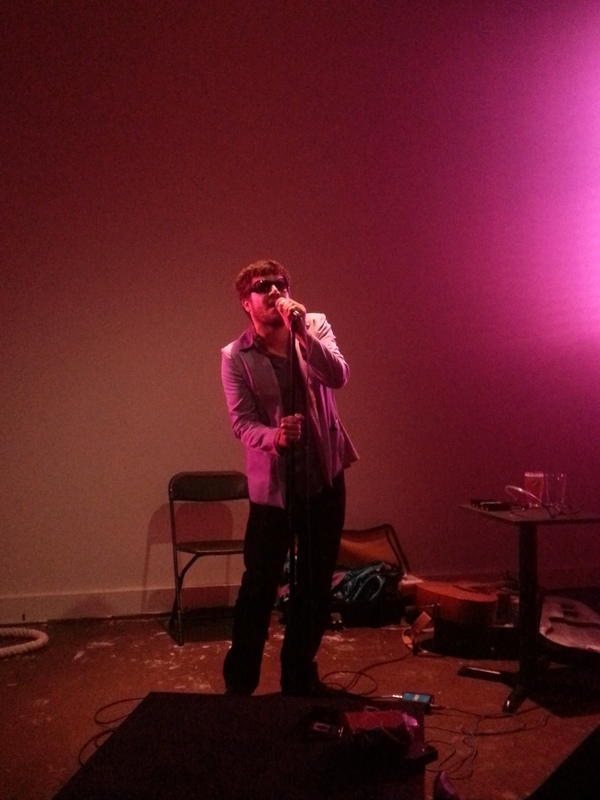 Daniel admits that “it’s great to see people respond to it [our music].” However; Daniel and the member of 3dCosby who is perhaps closest to him, Matt Ross, see music making as more than just a means for having fun; it is how they “do family.” Over a telephone conversation, Daniel talked to Music Historian about the history of 3dCosby, the album, Satan’s Secret, and most importantly, the development of their style. I am happy to introduce 3dCosby as the full-length interview feature on Hear; Don’t Listen for the month of July. Anybody who listens to Daniel talk about 3dCosby can believe that this band is a family. Daniel and Matt initially dabbled in the idea of forming a band. Then, once the two hit high school, the idea slowly turned into a reality. “Matt and I wrote our first song at 14 years old called “Never End” inspired by the author, Michael Ende who wrote The Never Ending Story. We also started playing in bars, coffee houses and in people’s backyards at that age too. Luckily, the break-up of Hillel was not the end of the friendship between Daniel and Matt. These two would continue to make music together. “After the band was already broken up, I drove to Matt’s house in New Paltz and decided to just jam. We soon started writing songs in his living room. 3dCosby still remains just Daniel and Matt, and their friends that are invited to play during live performances. So far, the band gained tremendous recognition for their album, Satan’s Secret. The track “Paint by Numbers” became the band’s hit. “This [“Paint by Numbers”] is a funny track. My younger brother wrote the lyrics, and it is about a guy named Colors, who only saw in numbers, and a girl named Numbers, who only saw in colors. It was originally an instrumental piece, but someone demanded we add lyrics. So, we gave Jesse, our bass player, my brother’s story, and asked him to write the lyrics. After the album was completed, Luke Sullivan, the musician who mastered Satan’s Secret suggested that 3dCosby send “Paint by Numbers” to Michael Marotta, a disc jockey who played songs by local artists in the Boston area on WFNX. Daniel and Matt have constructed their own world of excitement by incorporating their own jokes into their songs. In addition, the dance beats and funky rhythms and dissonances that accompany the lyrics in 3dCosby’s songs invade the minds of attentive listeners and music lovers without creating any discomfort or pain. Daniel validates my thoughts as he explains the meaning behind the album title. “When we were naming the album last year, this joke happened to come into our minds; then it became that 3dCosby was “Satan’s Secret.” We want to destroy you,” joked Daniel as he continued to make a reference to the Satan character in the 1999 South Park movie. As our conversation continued, I saw the progress between the beginnings of 3dCosby to the band’s full-length, Satan’s Secret, which was released in February of this year,as the result of Daniel and Matt’s musical development, their friendship and the appreciation of different musical styles. One individual that Daniel credits for fostering his and Matt’s appreciation for music is their history teacher from junior and senior year of high school, Mr. Lee. “When we graduated,” explains Daniel, “he gave me a copy of the book On the Road and two Frank Zappa albums. I didn’t listen to them until the year 2003. I was going to attend a protest in NYC against the war in Iraq, but ended up spending the weekend in Monroe, New York at Matt’s house. “When we were there, we really wanted to listen to something we had never heard before, so I found one of the Frank Zappa albums Mr. Lee had given me and I remember listening to the first track titled “Inca Roads” off the album, One Size Fits All.We loved this track; we literally took it with us in the car and drove around Monroe for one hour listening to this song. “This marked an important musical change in my life. This motivated me to get Frank Zappa’s albums, and through listening to them I was inspired me to revisit an album I already possessed by John Coltrane. Afterwards, I eventually fully understood jazz. Although Daniel and Matt graduated high school over 10 years ago; have experimented with several different musical groups; and have each jumped from job-to-job in order to support themselves; the members of 3dCosby always remember the friends that have helped them and the communities that facilitated their growth and love for performing. “This is what we want to be doing and we’re doing it our way,” says Daniel. “We’re gregarious; we have a strong sense of community and we love meeting new people. We also stay in touch with our friends from home. Matt still keeps in touch with the friends he’s known since he was a child. In today’s indie band culture, especially the one in the Big Apple, I too often feel that something is missing. Then it hits me – “Where are the solo guitar chicks?” I was happy to finally find one on a warm and rainy February evening, at Seth Glier’s set in Rockwood Music Hall. Here, I stumbled upon the voice and guitar playing of singer-songwriter, Hannah Winkler. One of the songs I heard from her that night, “Dear Love” – which is on her self-titled EP – left me in awe. It starts with an unsettling progression of minor 7 chords, followed by progressions of major 7 chords, and then finishes soundly on the tonic, the 1 chord. On top of these harmonies, she sings about how she simply cannot wait for love to arrive, even though it is warm and comforting. I wanted to find out more about the girl with the intricate chord progressions and the disillusioned views about love. So, I invited Hannah to be my April music feature for the full-length interview right here on Music Historian’s Hear; Don’t Listen. “During my freshman year, I was writing “Dear Love,” and one of my friends wrote lyrics which I later set to this song. Coincidentally, the lyrics he wrote happened to describe something I was experiencing at that time – a long distance relationship. The lyrics just fit with me, and I just finished with what he started. “Dear Love” became one of my favorite songs to play. “My relationships and my friends’ relationships in college inspired my music; we were learning a lot about ourselves at that time. Also, missing relationships from home, missing relationships from college while I was at home also inspired my songs. “I wrote a song after I left college called “The Paper Plate Song.” When I wrote it, I was at a concert, and I missed my friends so much that I started crying and had to leave the concert. As I left, I needed to write down what I was feeling, so I searched for whatever I could find to write on, and it happened to be a paper plate. 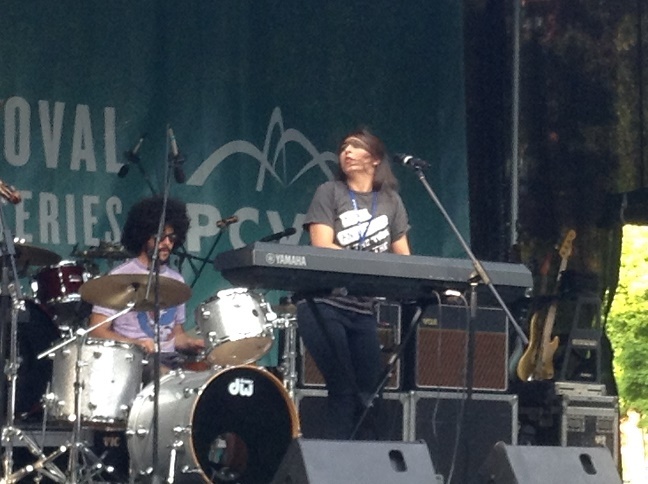 College was also where Hannah had her first performing opportunities for her own music. All her life, Hannah only performed solo classical piano pieces or performed in ensembles. Luckily, Ann Arbor offered her several safe and intimate spaces where she could practice as a solo artist and share music with her friends and the surrounding community. “I would perform for friends in my apartment and at a local church that welcomed a lot of jazz musicians. “I also participated in a student songwriting competition which took place at Ann Arbor’s premier folk venue, The Ark. The winner of this competition would get to open for an undetermined better-known artist at the Ark. I ended up winning the competition, and opened for Joshua James a few months later. This is just one way a singer-songwriter can attract opportunities. I then asked Hannah whether her move to Brooklyn was a result of her hunger for more opportunity. “Moving to Brooklyn, I was able to collaborate with several artists. I opened for Seth Glier and Theo Katzman at Rockwood. 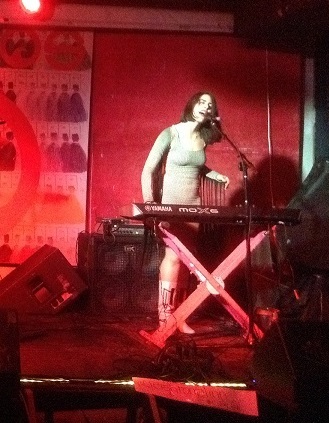 Then last Thursday night, I played at Googie’s with several other friends. I also sang back-up vocals on a record by the band called Guggenheim Grotto. Aside from singing with fellow artists, Hannah also scored a short film by her friend from college, Perry Janes titled, Zug. Her most recent single, “Hide it Away,” which she produced with Theo Katzman, is included in the film. Another one of Hannah’s friends, Brian Trahan, also from University of Michigan in Ann Arbor, helped her produce her EP. Hannah adds, “Recording the EP was a wonderful journey. I like painting with music, and you get do that in the recording process. “We only had a chunk of time each day to record songs. We had to wait for cars and ambulances to pass,” because every passing noise could be picked up by the recording devices. “I’ve been playing piano since the first grade. Then I picked up guitar in the 9th grade, and taught myself. I still have never taken a lesson. From the moment I picked up guitar, I started writing my own songs. I occasionally looked up the chords in songs from my favorite artists, but I never really learned them well. So I wrote my own. I was surprised to hear that Hannah composes songs purely by ear. I have played guitar for years, and actually picked it up around the same time as Hannah, but I only learned formally. When I wrote my own songs, I always used tablature and mastered simple major and minor chords. If I don’t have something written in front of me, I don’t know what to do. For Hannah, the power of experimenting and her gift for hearing is an outstanding musical asset. Hannah says, “I experiment with chords for a while until I find a structure I like. Then, I usually start humming a melody over it, and the words come last. That’s the hardest part for me. Since they are the only musicians creating their songs, the solo singer-songwriter is often challenged by their own compositional methods. Collaboration is definitely one solution that can ease this pressure. However, even the most eloquent songwriter has to push themselves to create a song that will successfully express their emotions or thoughts. Like every promising musician, Hannah has set goals for herself and has identified areas for improvement. One of these areas includes becoming more comfortable with performing. “It’s a very vulnerable thing,” Hannah explains. “Singing with a group of people is comforting as opposed to singing a personal song by yourself. I still get nervous at large gigs just as I’m about to perform, but I want to continue to do so. Once I’m on stage, I feel great. Hannah might have moved to Brooklyn for more opportunities, but her music career really started in Ann Arbor, Michigan. During this time, she learned to make connections with individuals, make herself known in a music community, and work with others on producing music. That warm Friday afternoon at a café called Sugar, Hannah taught me that no performance or musical idea is too small. What can start as an open mic night at a little club in Brooklyn, can lead to a performance in a large line-up in Manhattan. What can start as a few words on a paper plate can turn into a beautiful song on either an EP or a full-length album. With her a beautiful voice, a passion for playing guitar, and a talent for songwriting, I feel Hannah Winkler will definitely receive a warm reception from both fans and fellow musicians in New York City.